Whilst mass tourism to Thailand is one of the mainstays of the Kingdom's economy, individuals and small groups who are keen to promote responsible, sustainable tourism in the country are starting to offer experiences to the increasing number of visitors who want their holiday to make a difference. - The local community benefits directly via the creation of sustainable local employment, funding to protect its eco-systems, and the preservation and promotion of its culture. - Visiting unusual sights such as the market town of Kumphawapee where wild monkeys seem more numerous than townsfolk; impromptu markets where one can snack on grasshoppers and water beetles; enjoying village festivals where the lilting tones of Isan Morlam predominate; visiting a village where almost each household breeds King Cobra snakes...and much more. In turn, proceeds from holidays at the villa have helped to fund the education of children, medical care for villagers and donations to village schools, whilst creating local employment - and thereby playing a role in reducing economic migration to the capital. So, to all our past and future guests, a very big thank you! Ultimately, it was the growth of internet penetration that made such a model possible, allowing potential guests to discover and book a holiday directly from the local Thai families that operate the villa, without the need to pass via travel agents or tour operators who, by their very nature, tend to deal only in "products" that may be sold in volume. 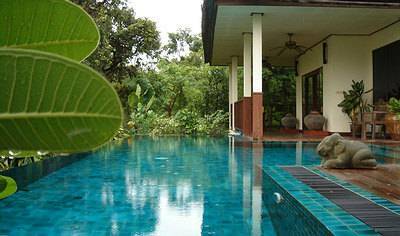 From the first inquiry via this Thai villa's website, to collection upon arrival in Udon Thani, and through to their departure, guests interact directly with the same players at the property, ensuring a direct and personal relationship throughout. As such, the world wide web has shown its power to connect people from across the globe, becoming, arguably, the most powerful ally of those interested in sustainable travel and small scale eco initiatives. Technology, ironically, has shown its ability to be not cold and clinical but warm and personal. We invite you to visit our website (http://www.geckovilla.com) for a virtual visit to the villa and our surroundings. We look forward to hearing from anyone keen to experience Gecko Villa, or from trade professionals who may be interested in offering their clients a unique and unusual opportunity to discover the property itself and the team behind the villa.